Cherokee Park is a 409-acre municipal park located along Cherokee Parkway and Grinstead Drive in The Highlands neighborhood of Louisville. The park was designed by famed park architect Frederick Law Olmstead in 1891 on part of a 4,000-acre military land grant from 1773. Two tunnels carry I-64 under Cherokee Park, built in the late 1960s to help lessen the impact the highway would have on the parkland. The park was damaged in the 1974 Super Outbreak, where thousands of mature trees were decimated by the tornadoes in early April of that year. 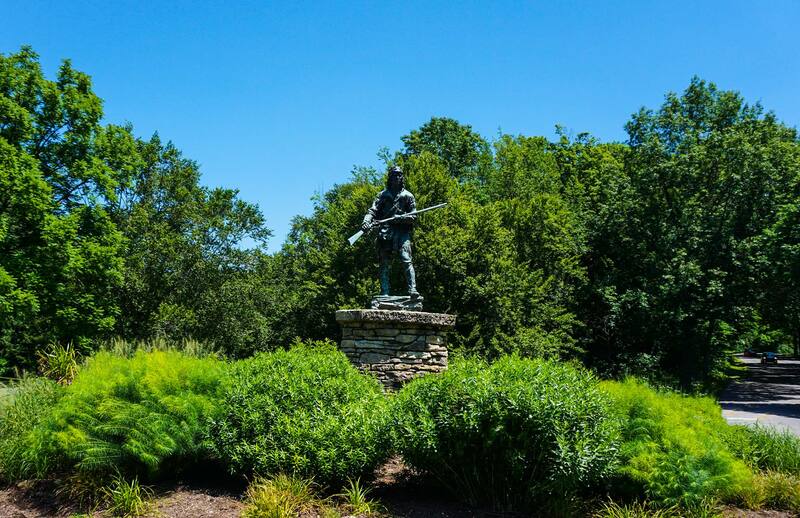 With help from the Disaster Relief Act of 1974 and consultation of the original Olmstead plans, Cherokee Park was brought back to life with 2,500 trees and 4,600 shrubs. Several amenities and landmarks dot the green space in Cherokee Park, including the 2.43-mile Scenic Loop. The mixed-use road circles the heart of the park, providing motorists, bicyclists and pedestrians with plenty of room to explore. Big Rock is a large rock in Beargrass Creek, which is used as a picnicking spot and -- for the crazy ones -- a place to take a dive into the creek. A fenced-off dog park at Baringer Hill provides Fido and Fluffy with unleashed fun. The hill itself is also perfect for those days when the winds are right for kite flying. Speaking of dogs, there's also a place for your pups (and ponies) to take a cool drink called Hogan's Fountain. The fountain is atop a hill within the Scenic Loop and was sculpted by local artisan Enid Yandell in 1905. The area around the fountain includes the Hogan's Fountain Pavilion -- a teepee-styled gazebo and gathering spot for the entire city -- baseball diamond, and basketball court. Other amenities at Cherokee Park include bike trail; spray pool at Hogan's Fountain; gravity hill on Scenic Loop; a nine-hole golf course; picnic areas; and fishing at Willow Pond. The majority of happenings at Cherokee Park occur in the neighborhood of Cherokee Triangle, the biggest happening being the Cherokee Triangle Art Fair. The juried fair hosts over 200 booths filled with arts and crafts as far as the eye can see. Held in late April every year, on the weekend before the Kentucky Derby, the two-day affair attracts over 20,000 annually. Following the fair from Memorial Day through Labor Day, the Cherokee Triangle Concert Series features artists from jazz, blues, swing, rock and more. On the night before the Kentucky Derby, head over to Cherokee Road and Spring Drive to see celebrities and VIPs walk the red carpet at the annual Barnstable Brown Gala. The affair is one of the biggest Derby parties around, with hundreds waiting outside the Barnstable-Brown Mansion to catch a glimpse of today's hottest stars from Hollywood, music, and Louisville's society scene.